Big Pine Lake (Aitkin) -- Jun 6-12, 2013 - - - 6 messages. Showing 1 through 6. I was at a cabin on Big Pine Lake in Aitkin for the last 7 days and the fishing was great. I had a bunch of non-fishing relatives from out of state, including some who had never caught a fish and they all had a great time. For my part, I cleaned more fish in a week than I did all last year. Bass were biting like crazy almost all day long. They'd take a short break during the afternoon, but other than that you could catch them all day long. Bass were mostly in the shallow lily pad area on the west end of the lake, but we caught plenty off the dock by casting about 30 feet out from shore. The biggest bass were 17 inches long, with most being about 12 inches long. Crappies were plentiful at dusk, attacking the bait so fast that you could hardly keep it in the water. They stuck near the dock and with about 15 feet from shore. We also caught 3 walleye, but they were only around 12 inches long. We tried various lures, but the most effective was a 1/4 oz. round jig head with a 4 inch piece of dark blue plastic worm with sparkles in it. Sticking the worm on at an angle made it possible to fish in the lily pads without too many snags too. 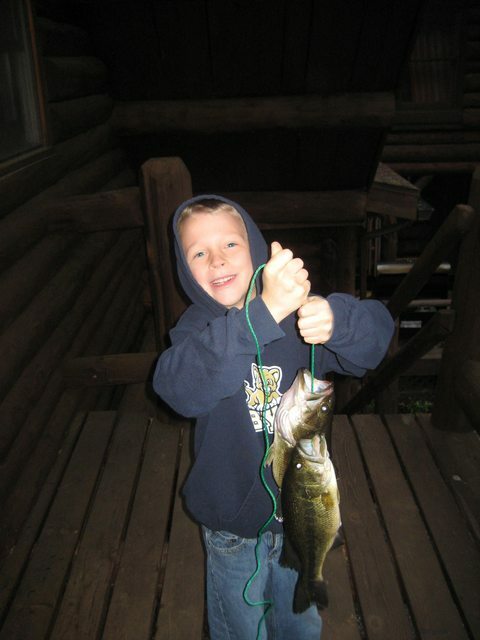 My son, who is 7, caught 17 fish, all by himself (though I unhooked them for him). 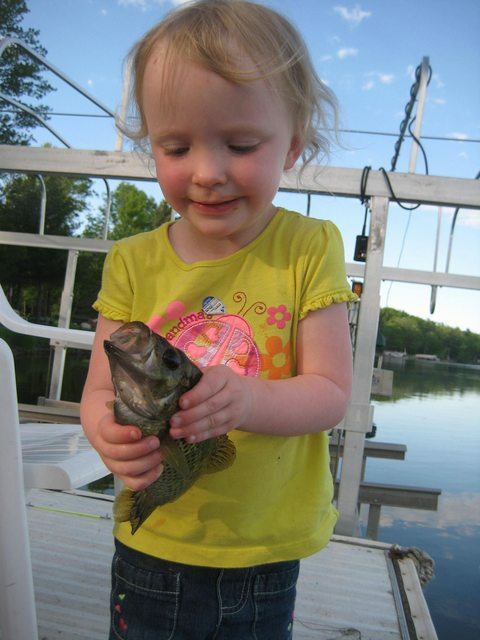 My 3 year old holding her first fish. 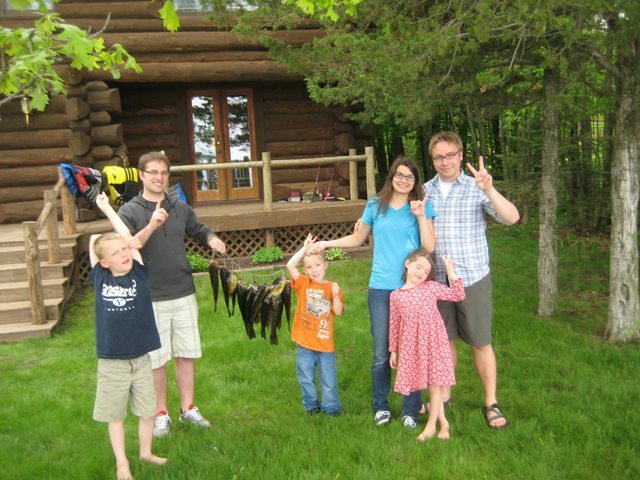 Various family members with the fish they caught. Very Nice! Would you mind if I posted these on the pics page? There is nothing like catching Pesky Bass! Unless it's Carp with Teeth!/ oh!!.... I mean walleye. "Very Nice! Would you mind if I posted these on the pics page?" That'd be fine, feel free. Thanks for sharing! I love adding kid's pics!